I got up this morning and ate breakfast, which is nothing new, but today I decided to venture out on the bike for the first time in three weeks, early doors this time instead of my recent after lunch jaunts out. I wasn’t really in the right frame of mind but as the Nike slogan says – “Just Do It”, so I did. My problem of course is that I can’t just go out and enjoy a quick ride around the countryside, no, I have to test out how fit I think I am even though as I have already said, I haven’t been out for three weeks and have only done 1 spinning session in the past two weeks. The word pillock springs to mind. 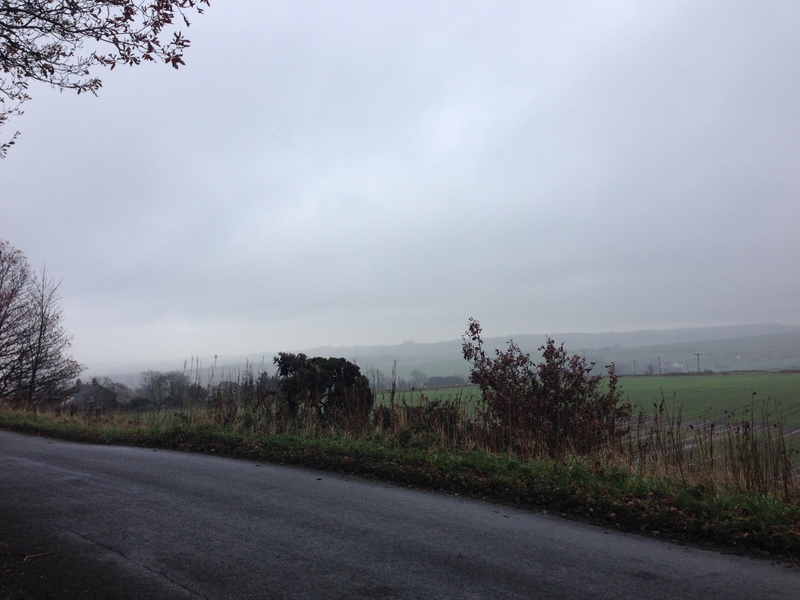 I wanted to ride to a place I know very well, it has great views across the Pennines and is the place I learnt to ride a motorbike around 30 years ago. 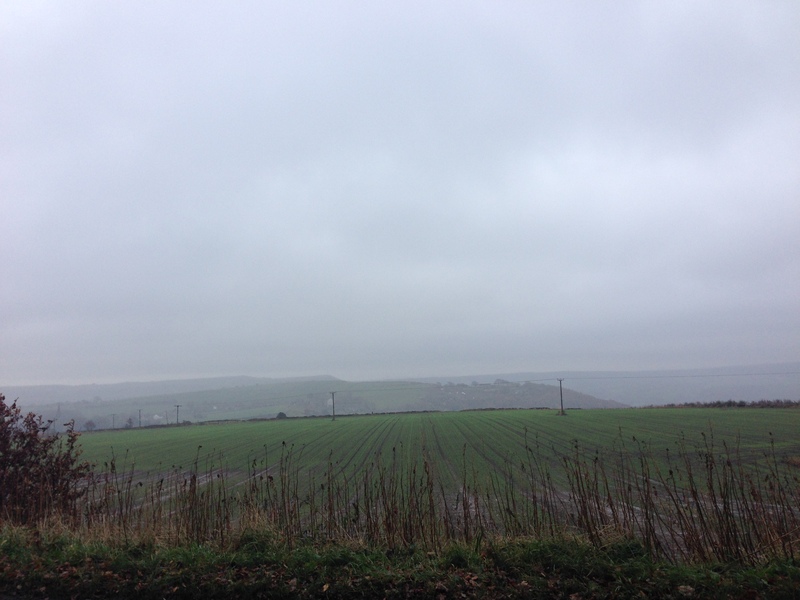 I took some pictures of the view which are below, very disappointing with the weather, a mixture of mist and freezing cold rain. The over doing it came from trying to ride up a very steep hill as fast as I could, normally I would be in a low ish gear, probably 8th (out of 24) I tend to not use the lower gears on the smallest cog unless the chain slips onto them, feels like too much effort for no real gain. This time I decided to stay in a higher gear, stand up and peddle hard, almost to a stand still. Last time I did this i was nearly sick. This time was similar, burning in the lungs and an overwhelming feeling that breakfast was on its way back. The only good news from this silliness is that I managed a personal best up said hill on Strava! Little compensation for overdoing it in the first 10 minutes and struggling along for the rest of the ride. That’s the worst thing, I struggled along and didn’t enjoy the ride. To be fair the wind and icy rain didn’t help either, but you can work through that if you are happy with the way things are going. Burning lungs, fast beating heart and nothing in the legs, which you can’t shake off makes the whole thing a bit of a drag. This is one of the few times that I have rode to a location, stopped for a rest and a drink, then turned round and went back exactly the same way as I had come. I like to do a circuit, yes I may enter and exit the circuit the same way but I like to go round rather then just there and back. There was another first today too. This is the first time I have dismounted and walked. Up a very steep hill. Not because I couldn’t make it, I just couldn’t see the point in peddling like a windmill going nowhere when it was just easier to get off and push. Part of my triathlon training I told myself, learning to walk / run straight after getting off the bike – try it, it’s not as easy as it sounds. I am trying to get as much distance covered as possible with a view to breaking the 200 mile mark for this year! I only found out the other day that riding an exercise bike was called spinning, all that time I just thought it was just a plain old exercise bike! I’ve owned my bike for the best part of 10 years or more, only using it as a clothes horse and a place to dry my towel. Kind of expensive bit of kit to just hang clothes on but hey, I never really took to riding a static bike. I guess that’s why I enjoy riding outside now, being able to look at the views and breath in the fresh air. But not today. No matter how nice it looked outside there was little chance of me being able to get out in the sunshine. Having taken my son’s under 7 football team just before lunch to a crushing defeat to our local rivals, I was knackered and needed a break. I then took the time to clear the exercise bike of clothes and said towel, so I thought I might as well see how I felt after a few minutes of gentle peddling. To my surprise I felt really good after the first 10 minutes, the time I used to give up at when I last used the exercise bike. Even at 20 minutes, a personal record, I wasn’t really out of breath. It was only when my mobile rang at just over 25 minutes that I started to feel like I was exercising, taking the call and thus clocking up more km than I intended. I only wanted to ride 10km to see how long it took – on the road around the windmills 10km takes about 30 minutes riding flat out but still taking a breather on some of the downhill sections. On the exercise bike with constant peddling I manged 11.2km in 30 minutes, which included taking the phone call and dropping the tv remote on the floor whilst trying to get the football in HD. I won’t be blogging about my personal spinning exploits from now on, I just wanted to share my first experience of it in quite some time whilst it was fresh in the memory. I realise that I will need to push myself a little harder on the exercise bike than I did today to get anywhere near how it feels out on the bike in the winter sun, but for a first time in a long time I don’t think I did too badly. Like many other people, I use Strava to log how far I ride and how long it takes. This is great when I only ride on the road, but I ride a mountain bike and every now and again I like to use it for what it was designed for and what I really bought it for and go off-road. What Strava can’t take into account is the amount or depth of mud you have to wade through when you go off-road, neither does it take into account the wind speed, but I guess that’s the same for everyone. Off road is so much more fun and much tougher than riding in the road, it also gives a sense of adventure you just don’t get anywhere else. It may be true that when you are on the road you don’t risk life and limb ducking under tree branches to the left whilst riding across slippery cobbles, trying not to drop down a ditch on the right, but hey its worth it! For this ride I went out with a friend, one of the two I started riding with in June. This is probably why we went off-road in the first place, don’t think he’s much of a ride round the windmills type of guy. 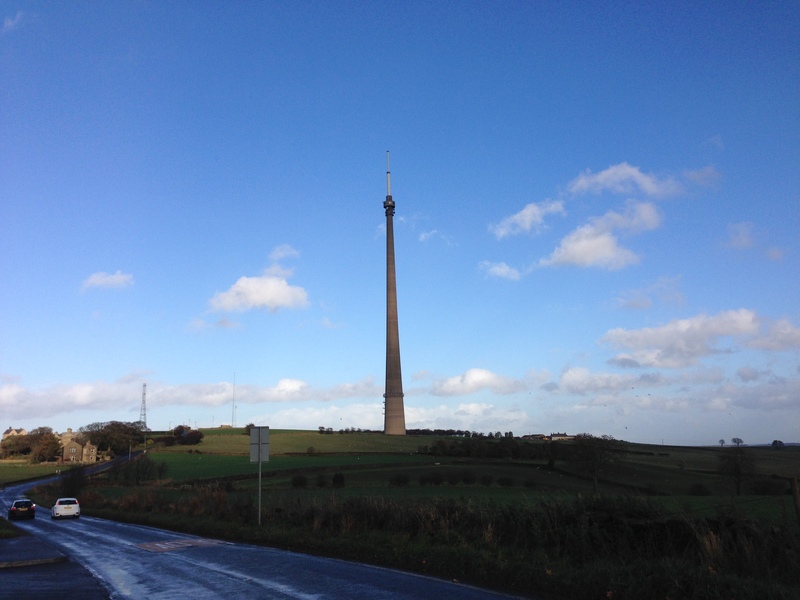 Around here if you want to ride off-road you have to go more towards Emley Moor than away from it, that means you have to go down into the valley then back up towards the mast. You can get quite close to the base of the Mast, but can no longer go up it for health and safety reasons. 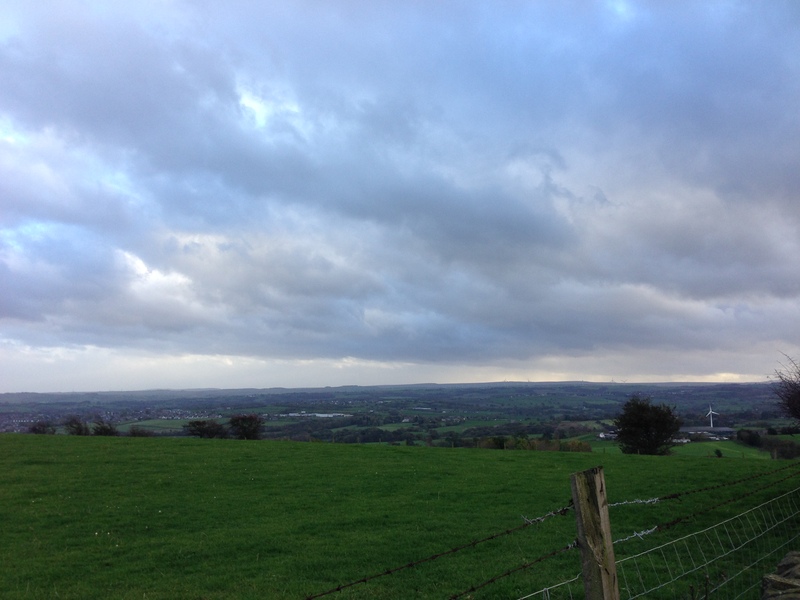 I’m sure the view from there is stunning as you can see back towards the windmills – Sheffield and Manchester, along with the other side of the hill towards Wakefield and beyond. The view below is looking back towards the windmills which I thought made a good contrast to my usual photos that have or look towards the mast. The windmills are to the right on the horizon and not the one you can see in the centre right! 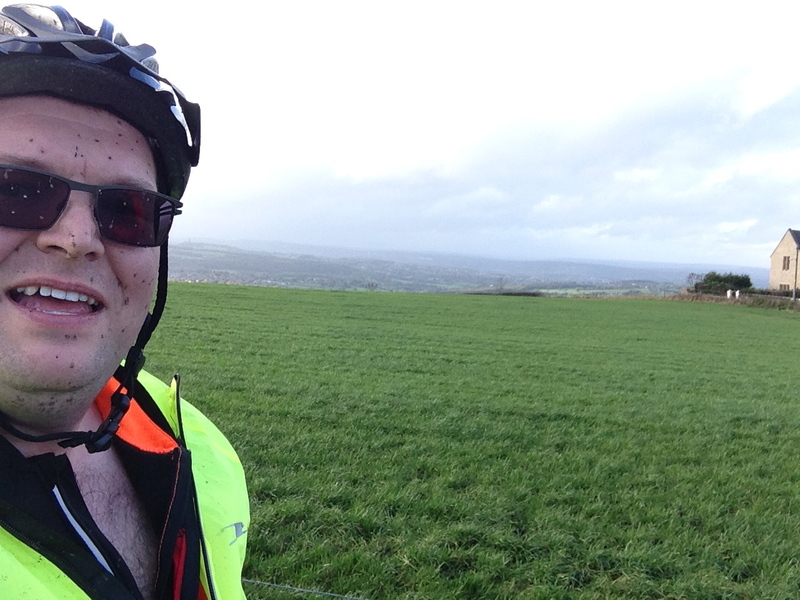 I also took a quick picture of myself for the first time on a ride, covered in a bit of mud from the off-road bits, very wet out and very windy. The problem we had coming back down from the mast (we rode around up there for a while too, not just up and back down) was that the wind had picked up and was blowing straight into our faces. So even though we were riding downhill we had to pedal hard just to keep moving, the gusts where quite scary too, almost knocking me off a couple of times. If you squint you can just about see Castle Hill just outside Huddersfield next to my Sunglasses. As we move into November I think I will take up jogging in my quest to compete in my first (and probably last) triathlon in 2014.